Have a nice day! Hope it helps. KEY INCLUDED!This is a revision for my pupils. 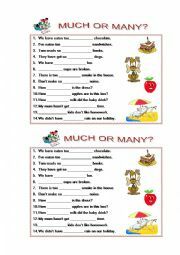 Hope you like it and it is useful. Have a nice day! 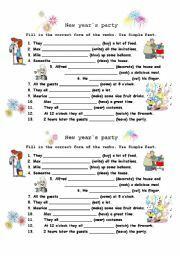 worksheet with regular and irregular forms. Have a nice day! 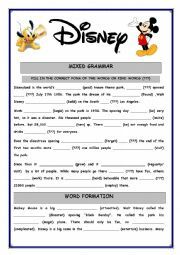 This worksheet includes mixed grammar and word formation.The key to this can be found -> my Disney powerpoint Have a good day! 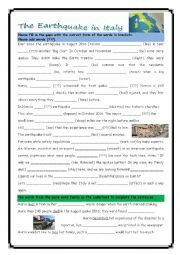 This worksheet is for real beginners, it doesn�t even contain any negations. It�s simply training. 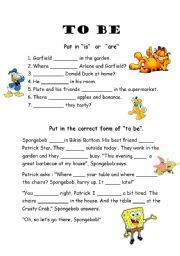 My pupils love Spongebob and so on.... Have a nice day! This is an animated ppp with a free template background (source is given). 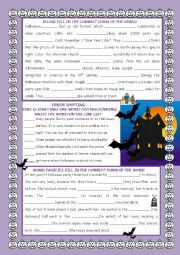 The kids have to form sentences and find the answer. My pupils liked it a lot... so I guess I have to do more ppps in future with "the crabs". ;-) Have a nice day. 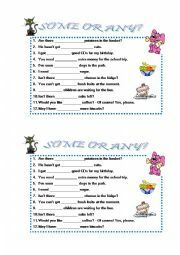 This is a powerpoint to practise positive statements (simple present). 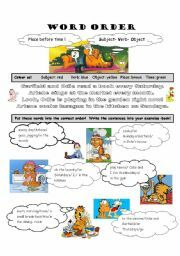 Hope your pupils like it (mine did) and it is helpful for you. Hope it is useful :-) Have a nice day! 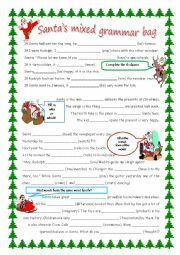 easy grammar exercise. have a nice day!